You Say 'Amato': Bill Dill serves it up Philly-style at Amato's. EVERY CITY should have its own special sandwich. Chicago's got its famous hot dogs. New Orleans (may she rise again) has its po' boys. And Philadelphia has the cheesesteak. As for San Jose, we've got what? Turkey, Swiss and avocado on wheat? Wraps? Until we have a sandwich to call our own, you're better off seeking out the best transplanted sandwiches the South Bay has to offer. And in the case of the cheesesteak, there are several restaurants to choose from. I've never been to Philadelphia, but I love the city's signature sandwich. According to the cheesesteak-obsessed website www.bestcheesesteaks.com, the artery-thickening sandwich was invented in the 1930s at Pat's King of Steaks in south Philly. Since then, the griddle-fried concoction of thinly sliced beef, onion and cheese stuffed into an Italian roll has multiplied and prospered all over the country and kept heart surgeons busy. Sonia's Kitchen in San Jose has all the hallmarks of a good cheesesteak shop. It's in a semidicey part of town near SJSU. The 24-year-old restaurant occupies a pale yellow building that's plain to see was once a gas station, adding to its charm. You place your order in a tiny, dingy room and the no-nonsense lady behind the counter shouts out your order over her shoulder to the cook manning the griddle. You can take a seat at one of the stools by the window inside, but a better bet is to eat at one of the green picnic tables outside under the shade of an elm tree. Sonia's is cash-only, so if you're short, head across the street to the liquor store ATM. While you're at it, grab a beer and have the clerk put it in one of those little brown paper bags that make your beverage invisible to the police. Sonia's serves hamburgers, grilled cheese and other sandwiches, but the main attraction here is the cheesesteaks. I went for a medium combo steak—griddled steak with provolone cheese, onions and green bell peppers—for $5.60. The sandwich was cut in two and packed with meat and vegetables. It's a hearty satisfying sandwich but I had to take points off for the meat and the roll. While most of the meat was tender and pleasantly griddle fried, some of it was gristly and tough. For me, the roll is what ties a cheesesteak altogether. Too much bread and it overshadows the fillings. Too little and the sandwich becomes soaked with oil and grease and threatens to fall apart. Sonia's roll suffered from the first problem. The meat-to-roll ratio was out of proportion. And it would have been better toasted. 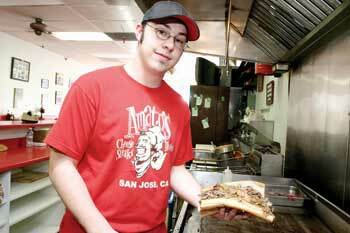 My next stop was Amato's, a serious cheesesteak joint in an anonymous-looking strip mall on Saratoga Avenue. When I stopped in for a cheesesteak a few hours after my trip to Sonia's, the griddle was loaded up with mounds of top round beef. The grill guy worked his station with a rhythmic clatter and clang of the spatula. Nearby, someone else was slicing more steak from a mighty slab of beef, so you know the meat is fresh. For consistency's sake, I ordered "the works," a combination sandwich of steak, mushrooms, peppers and onions ($7.15). The smallest sandwich you can get is a 7-inch "shorty," but there's nothing small about this hulking sandwich. My cheesesteak arrived tongue-burning hot from the grill and packed full with meat. Once it cooled down, the sandwich proved to be a cheesy, meaty sensation. A good cheesesteak is a visceral, hedonistic pleasure, and Amato's has it to spare. Like Sonia's, though, I found fault with the roll. It was light and springy but there was too much of it. With a sandwich that packs that much meat and vegetables, the bread should play a supporting role, but I found myself picking off chunks of bread to lighten the load. Maybe I've got a thing with toasters but I think a light toasting would have made it better, too. After popping a couple of cholesterol-fighting omega-3 capsules the following morning, I headed off to my last stop on my cheesesteak tour: Jersey's Tavern in Campbell. While Sonia's and Amato's are straight-ahead eateries, Jersey's is a sports bar that happens to serve food. I counted at least 10 TVs, and the place is packed with sports memorabilia, especially from the Philadelphia Eagles. Even at lunch on Wednesday the place had a lively roar. Stop in on a weekend game day and I bet the place goes off. But any day of the week, it's the cheesesteaks that really shine. At $7.50, Jersey's combo cheesesteak was the most expensive I tried. But it was also the best. The monster sandwich bulges with expertly grilled steak, onions and peppers and gooey cheese. The grease that dripped onto the table quickly coagulated as it cooled. My advice is not to look at that and just focus on the sandwich. In spite of its bulk, the sandwich had a certain restraint and finesse that I attribute to the all-important roll. Light yet sturdy, crunchy on top and soft within, the torpedo-shaped roll was the perfect foil for the meaty masterpiece. And best of all, it was toasted. Address: 1162 Saratoga Ave., San Jose. Hours: 11am-9:30pm Mon-Thu and 11am-10pm Fri-Sat. Price Range: $5.95-$7.15 (for small sandwiches). Address: 1781 Winchester Blvd., Campbell. Address: 360 E. William St., San Jose. Send a letter to the editor about this story to letters@metronews.com. From the October 5-11, 2005 issue of Metro, Silicon Valley's Weekly Newspaper. Copyright © 2005 Metro Publishing Inc. Metroactive is affiliated with the Boulevards Network. For more information about the San Jose/Silicon Valley area, visit sanjose.com.